1.Jason E. Gestwicki, Co-Chair, et al. "Strategies and functional consequences of inhibiting protein-protein interactions." University of Michigan. 2016. Lee K H, Lee J H, Han S W, et al. Antitumor activity of NVP‐AUY922, a novel heat shock protein 90 inhibitor, in human gastric cancer cells is mediated through proteasomal degradation of client proteins. Cancer science, 2011, 102(7): 1388-1395. Jensen M R, Schoepfer J, Radimerski T, et al. 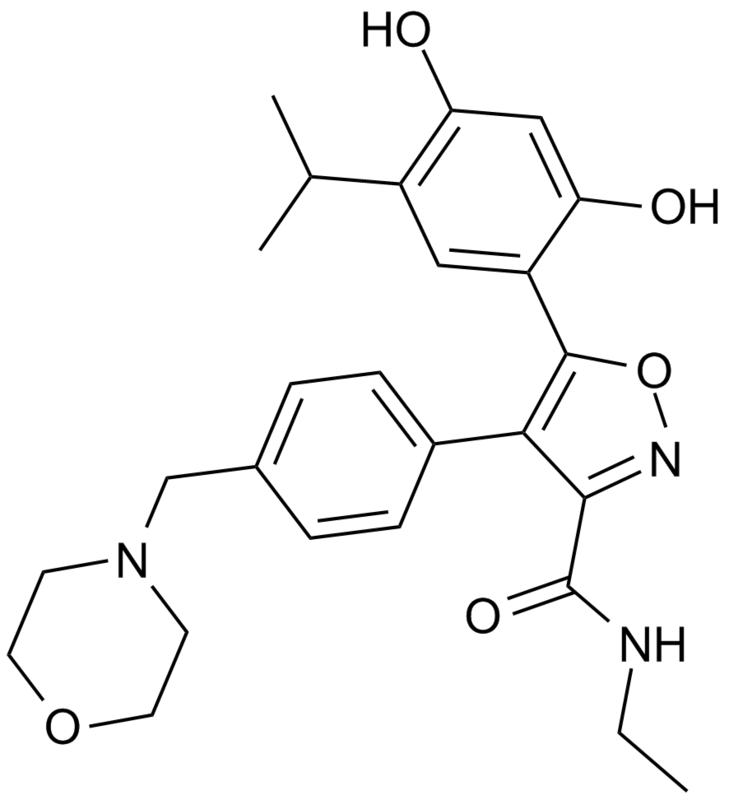 NVP-AUY922: a small molecule HSP90 inhibitor with potent antitumor activity in preclinical breast cancer models. Breast Cancer Res, 2008, 10(2): R33. 1. Inhibition of HSP90 with AUY922 induces synergy in HER2-amplified trastuzumab-resistant breast and gastric cancer. Mol Cancer Ther. 2013 Apr;12(4):509-19. doi: 10.1158/1535-7163.MCT-12-0507. Epub 2013 Feb 8. The mono-therapy of AUY922 in the low nanomolar range potently inhibited proliferation of human gastric and breast cancer cells exhibiting a greater sensitivity to HER2-amplified cells than HER2-negative cells; while the combination of AUY922 and trastuzumab showed synergistic anticancer effect in conditioned trastuzumab-resistant models. 2. 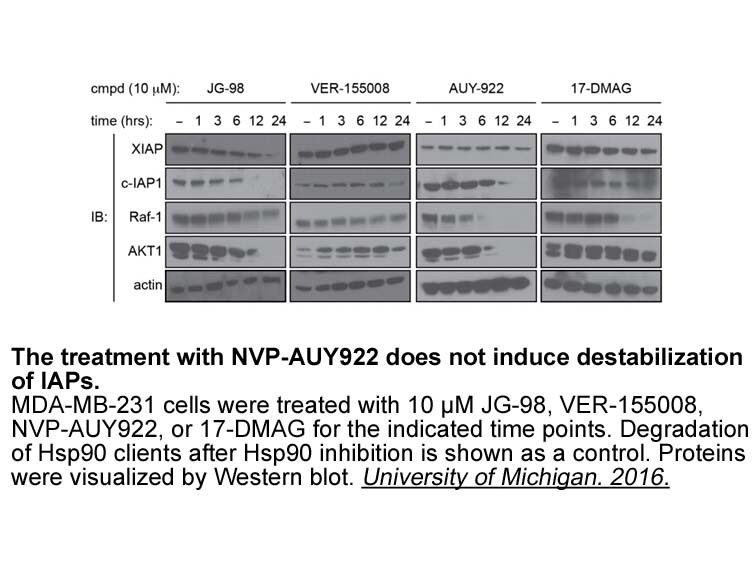 Novel Hsp90 inhibitor NVP-AUY922 radiosensitizes prostate cancer cells. Cancer Biol Ther. 2013 Apr;14(4):347-56. doi: 10.4161/cbt.23626. Epub 2013 Jan 28. 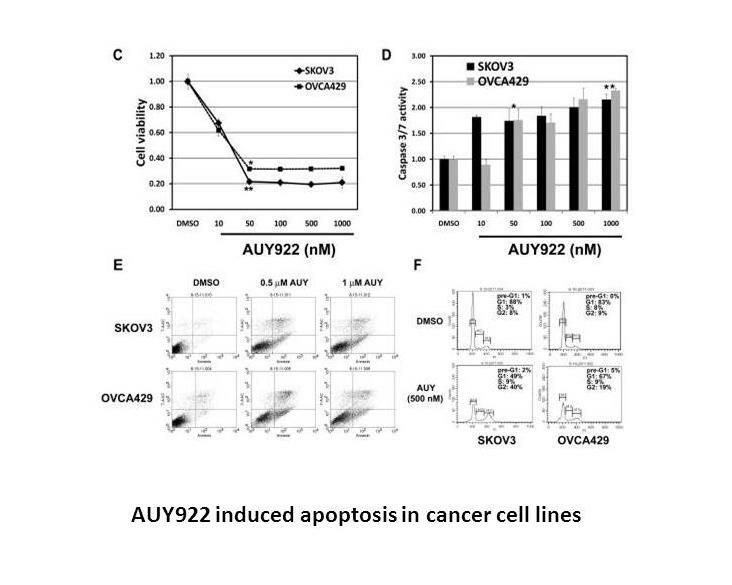 AUY922 greatly increased the sensitivity of prostate cancer cells, Myc-CaP and PC3, to radiation and worked synergistically with radiation to increase apoptotic cell death, induce G2-M arrest, affect client protein expression and delay tumor growth. 3. 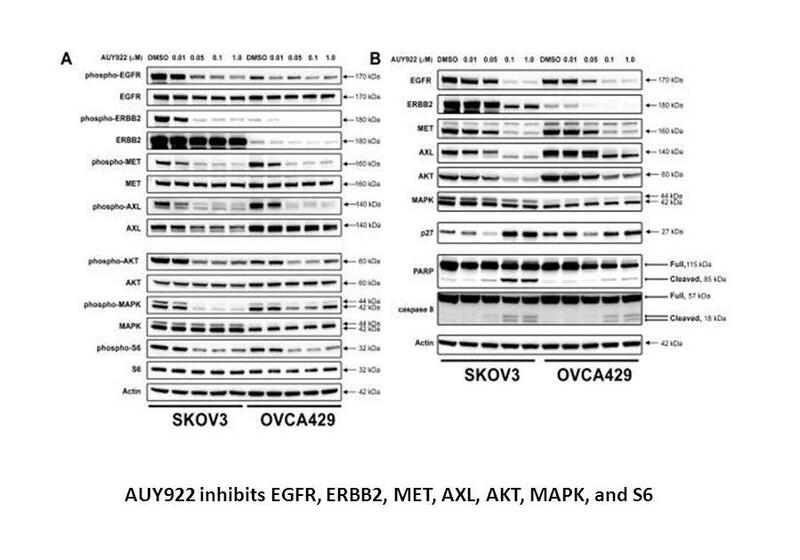 The HSP90 inhibitor NVP-AUY922 potently inhibits non-small cell lung cancer growth. Mol Cancer Ther. 2013 Jun;12(6):890-900. doi: 10.1158/1535-7163.MCT-12-0998. Epub 2013 Mar 14. AUY922 ont only exhibited potent anticancer activity against NSCLC cells with IC50 and IC100 of 100 and 40 nmol/L respectively but also affected expression of genes involved in various cellular functions including decreased dihydrofolate reductase, where exposure to AUY922 stably slowed growth of A549 xenografts and decreased the expression of EGFR protein in H1975 xenografts. 4. The HSP90 inhibitor NVP-AUY922-AG inhibits the PI3K and IKK signalling pathways and synergizes with cytarabine in acute myeloid leukaemia cells. Br J Haematol. 2013 Apr;161(1):57-67. doi: 10.1111/bjh.12215. Epub 2013 Jan 29. NVP-AUY922-AG alone or synergistically with Ara-C exhibited anti-cancer activity against myeloid cell lines and primary AML blasts with significantly less toxicity to normal bone marrow, in which it induced increases in HSP70 expression and depletion of total AKT, IKKα and IKKβ. 5. Antiproliferative effect of the HSP90 inhibitor NVP-AUY922 is determined by the expression of PTEN in esophageal cancer. Oncol Rep. 2013 Jan;29(1):45-50. doi: 10.3892/or.2012.2074. Epub 2012 Oct 9. NVP-AUY922 significantly suppressed the activity of AKT and ERK and potently induced antiproliferation in ESCC cells, which are negatively associated with PETN expression. Suzanne A. E, Andy M, Florence I. R, et al. 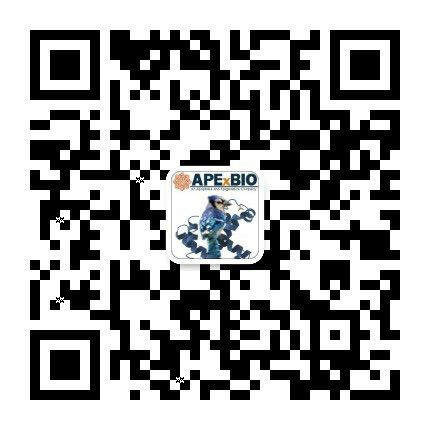 NVP-AUY922: A Novel Heat Shock Protein 90 Inhibitor Active against Xenograft Tumor Growth, Angiogenesis, and Metastasis. Cancer Res. 2008, 68. 2850-2860. Tsuyoshi U, Kazunori T, Shinichi T, Midori A, Munenori T, et al. 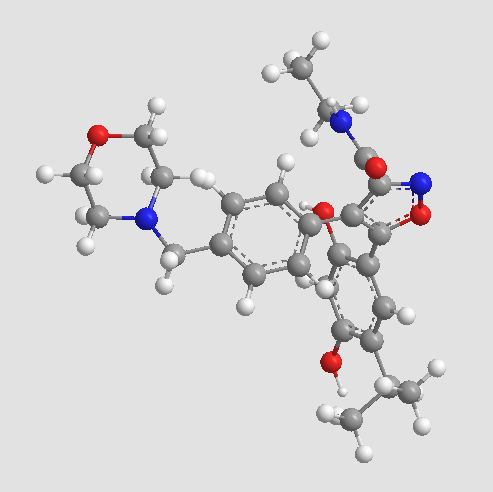 Strong anti-tumor effect of NVP-AUY922, a novel Hsp90 inhibitor, on non-small cell lung cancer. Lung Cancer. 2012, 76. 26-31. Kyung-Hun L, Ju-Hee L, Sae-Won H, Seock-Ah I, et al. Antitumor activity of NVP-AUY922, a novel heat shock protein 90 inhibitor, in human gastric cancer cells is mediated through proteasomal degradation of client proteins. Cancer Sci. 2011, 102. 1388–1395.